Tension prevailed at ward 13 near Mochi Sahi square here during the BJD Jan Sampark rally following a scuffle between the party workers and Congress activists. Several BJD workers, including leader Ramakrushna Dasmahapatra, sustained injuries. Later in the day, they staged a demonstration demanding police action. Ramakrushna was leading a rally of BJD workers when some Congress members threw rotten eggs, ‘chappals’ and stones at them. 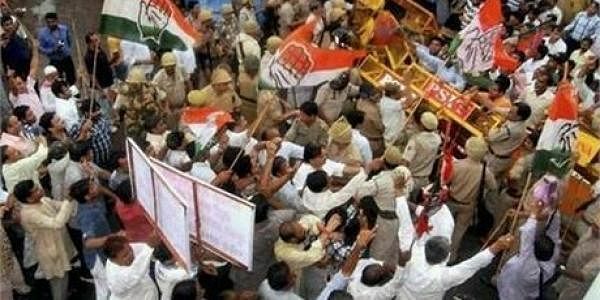 This led to a clash between the workers of both the parties. Congress had retained this ward by defeating the BJD in the last civic body polls. The demonstration was called off after Tourism Minister and local legislator Maheswar Mohanty arrived at the spot. In the meantime, some BJD activists tried to attack a hotel owned by a Congress leader. Timely police intervention stopped them from attacking the district Congress office. Police said the BJD had neither informed the police nor taken permission for the rally. In another incident, some BJD workers allegedly barged into the house of Pradipta Mohanty, a senior CPI leader, and ransacked it. The CPI leader alleged that the police did not take any action against the culprits even after they were informed.